September is moo-ving right along, and the food celebrations continue. The 9th is National Steak au Poivre Day! It’s also National Wienerschnitzel Day and National I Love Food Day. All of these choices sound celebration-worthy. This blog exists because we love food, so in that regard we’re celebrating our love of the edible all year long. We debated going with wienerschnitzel – there’s a great German restaurant right here in town – but I was intrigued by Steak au Poivre, so we decided to give that one a whirl. 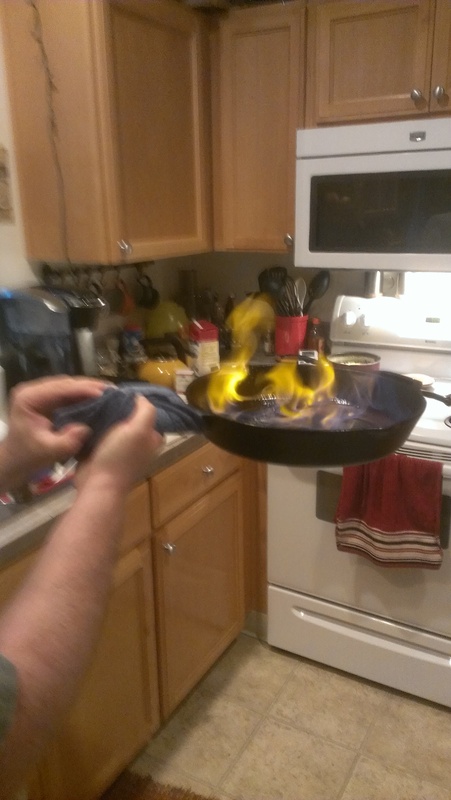 Setting food on fire is always fun! So what the heck is Steak au Poivre, besides difficult to pronounce? (It’s ah-pwav-er, but you have to roll your tongue and arch your back and hold your breath while reciting the alphabet backwards skipping every other letter). Just call it “pepper steak” instead. 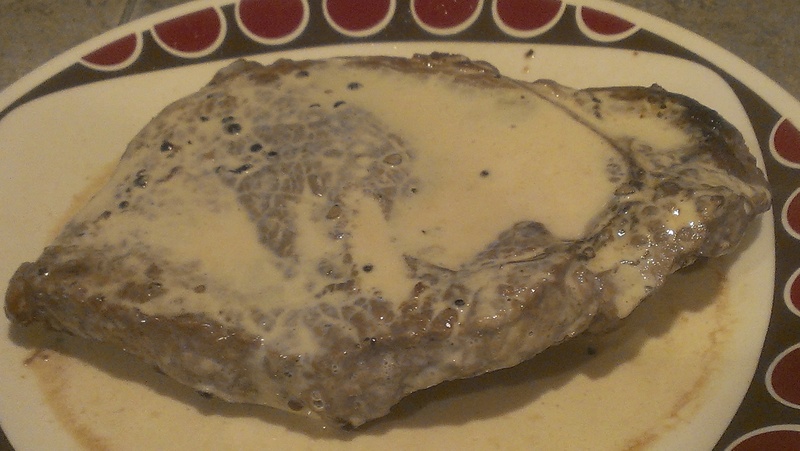 This French dish is made with steak (Julia Childs said, “This famous dish usually calls for individual tenderloin or loin strip steaks, but other cuts may be used if they are of top quality and tender”) steak coated with cracked peppercorns that form a crust, and then cooked in a hot skillet with butter and oil. It’s served with a pan sauce containing cognac and heavy cream. Yum! Steak au Poivre is a descendant of Steak Diane, though its exact origins aren’t clear. Several chefs claim to have invented the dish in the 1920s and ’30s, but it was already a specialty at the Hotel de Paris in Monte Carlo in 1910. Evidence suggests it may actually have royal origins: Leopold I, king of Belgium, was a skilled cook who came up with a recipe for beefsteak and peppercorns that certainly resembles modern-day Steak au Poivre. To celebrate, we turned to the man who mixes science and food: Alton Brown. His recipe for Steak au Poivre looked remarkably simple – and it was! There’s nothing difficult about making this dish; it’s all about the flavors. And these were delicious: the sauce was earthy and creamy, the steak itself, peppered to perfection. We really enjoyed this meal! Nice shot of the fire!! I love Steak Diane but Steak au Poivre sounds and looks delish!! The cast iron skillet was very heavy and I nearly burned down the kitchen. But hey, it was worth it for the delicious meal!